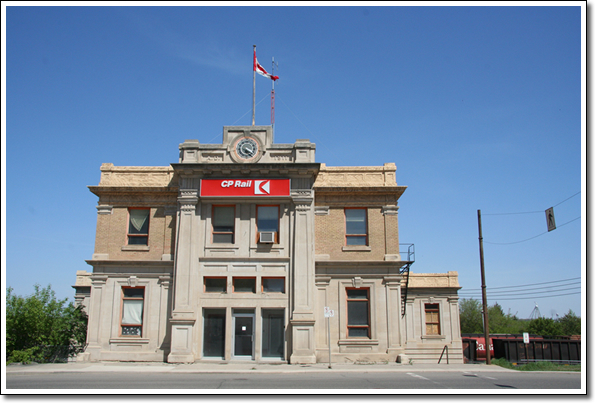 The Canadian Pacific Railway Station in Brandon is among the three largest and most impressive CPR stations extant in Manitoba. These kinds of stations, denoted First Class by the company, were located at important business and divisional points, and were intended to symbolize the company’s wealth and sophistication. The choice of the Beaux-Arts classical style for Brandon’s 1911 station, executed in grey stone and buff brick, indicates the expectation of Brandon’s importance as a principal city of the province; it became an important administrative, freight and repair headquarters for both the main and branch CPR lines that passed through the city. Its continued physical relationship with the railway tracks, the street and the extant industrial buildings that depended on rail connections for their success make it an important physical reminder of the engines that spurred Manitoba’s development period.